FinePix REAL 3D V3 — 3D Digital Viewer — Brighter, glasses-free! Fujifilm continues to stay at the forefront of 3D imaging technology with the introduction of the new FinePix REAL 3D V3. FinePix REAL 3D V3 sports some exciting new functionality that takes your viewing of 3D still photos and movies to the next level. Key improvements have been made to the screen, which is substantially brighter than its predecessor and now uses a lenticular system for glasses-free 3D viewing, plus the V3 Viewer also supports High Definition 3D still photos and movie playback as well as compatibility to other 3D devices via HDMI input: a world's first in a 3D Digital Viewer. The FinePix REAL 3D V3 Viewer is the first from Fujifilm to use a lenticular system for viewing images. The “no-glasses required” system makes for crystal clear 3D images, and don't suffer from any on-screen flickering. Images are viewed through a series of lenses aligned on a sheet at left and right angles. As a result, the left and right eyes view different images with the parallax difference between the two eyes creating the 3D effect. With 2.88 million dots and LED backlighting, you will be able to see images with amazing sharpness and clarity. Naturally, the V3 Viewer doesn't only support 3D still photos and movies, standard 2D still photos and movies can also be viewed at a maximum resolution to 10,000 x 10,000 pixels. The full color display offers an impressive 16.77 million colors to provide superb color accuracy and has a wide viewing angle of up to 160° horizontally and 140° vertically. With the range of 3D products expanding, Fujifilm has become the first company to incorporate an HDMI input on a 3D viewer, which extends its compatibility and versatility. 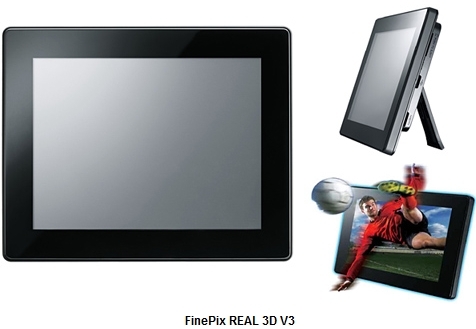 3D images can be viewed by connecting HDMI-enabled 3D devices including FinePix REAL 3D W3 digital camera, Blu-ray disc players, video camcorders and gaming machines to the FinePix REAL 3D V3 Digital Viewer. Users capturing 3D movies can view them in 720p High Definition on the FinePix REAL 3D V3 Digital Viewer, a substantial improvement over the VGA-only offering from the V1 Viewer. What's more, the V3 Viewer's built-in stereo speakers offer high quality sound to enhance the movie viewing experience. The FinePix REAL 3D V3 Digital Viewer offers a range of viewing options to ensure the still photos and movies are seen at their very best. Its black frame emphasises the 3D effect while the supplied stand can be adjusted in eight steps so you're always assured of seeing the perfect 3D image. In addition the V3 Viewer can be mounted on a pocket tripod and finely adjusted to display optimum 3D images. Additional built in features include a slideshow function, calendar, clock and timer displays, plus the compatibility to play WAV audio files in slideshow mode and support SD and SDHC memory cards. A remote control is also provided for hands-free operation.